The term “water footprint” is part of the vocabulary of the green revolution. It is used to describe the amount of water used by an activity. I’ve recently heard the suggestion that dwarf orchards reduce farming’s water footprint. I went out to have a look. This is what is referred to as a low water footprint orchard. Such orchards allow for rapid replacement of trees by new varieties capable of fetching higher store prices. It is a capital-intensive business not for the faint-of-heart. These trees are three years old. 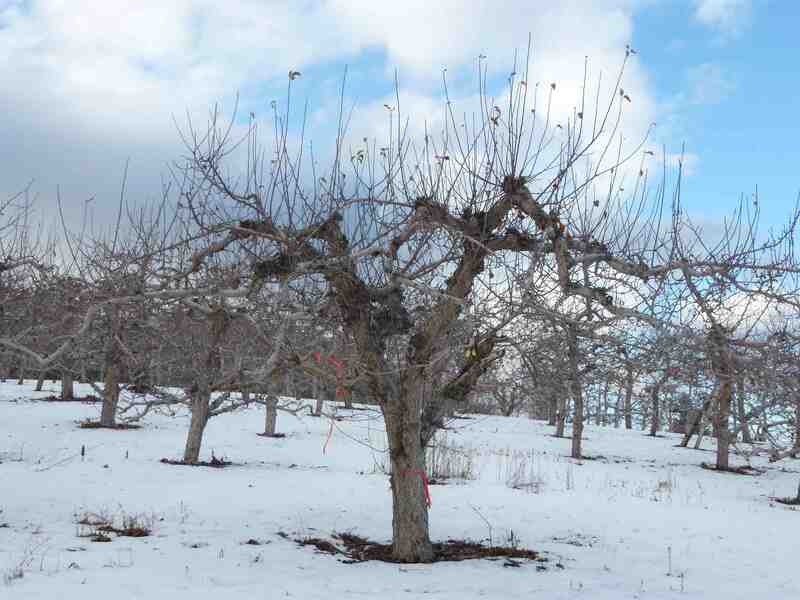 Yield per tree will likely be in the range of 10 – 20 apples, doubling in a couple years, a low figure partially offset by a high number of trees per acre. Ellison Lake. 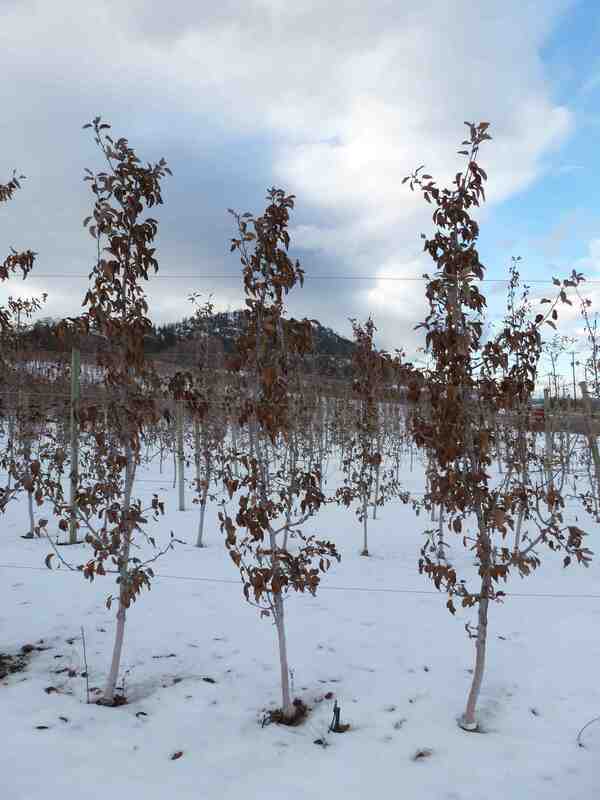 Yield is going to be around the same as a mature slender spindle orchard. Fifty years ago, the largest trees around would fill eight times the volume of space as this tree, which has been pruned hard to keep it low for easy picking. On first glance, it seems like contemporary dwarf orchards are incredibly efficient. 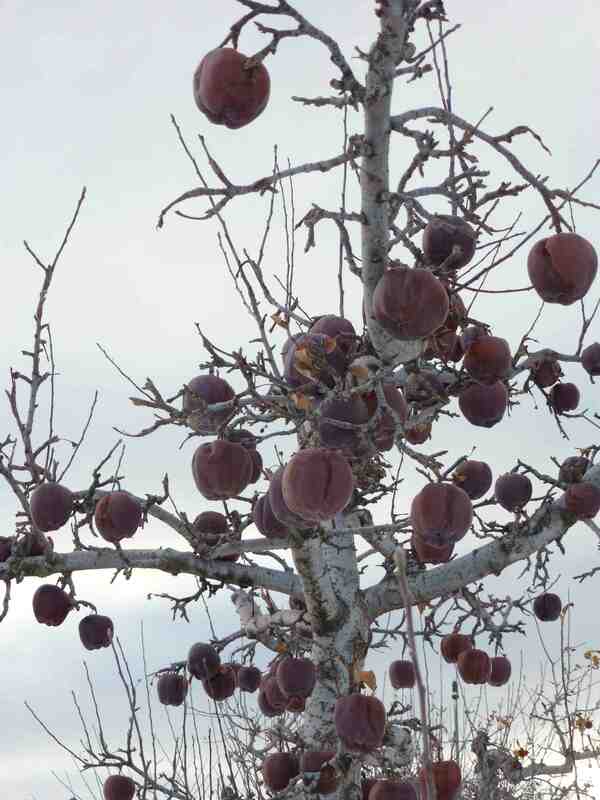 After all, they produce around 70% as much fruit as the best of older orchards. One would expect that the water footprint would be correspondingly low, but it isn’t, because the total exposed ground area per acre remains constant, regardless of the height of the trees. On second glance, water usage for apple production in the Okanagan decreased 19,000,000 cubic metres between 1991 and 2001 — the decade in which most older orchards were replaced with dwarf orchards, and most older water technologies were replaced with new ones. Tonnage remained the same. On third glance, in a hundred years, Okanagan farmers have moved from ditch irrigation, to sprinklers moved on a twelve-hour rotation, to tiny, high-tech microjet sprinklers capable of delivering precise amounts of water exactly where and when it is required. Technological improvements have been huge. Look to them for your savings. These unpicked double red delicious apples represent a significant amount of water that went to naught. The problem isn’t the training system. It’s that nobody wants this junk. Including the local juice processing plant that prefers to bring its juice in by tankers from the United States. To sum up, a 30% saving of water due to new water technology seems to me to be offset perfectly by a 30% decrease in production per acre, for a dubious saving. 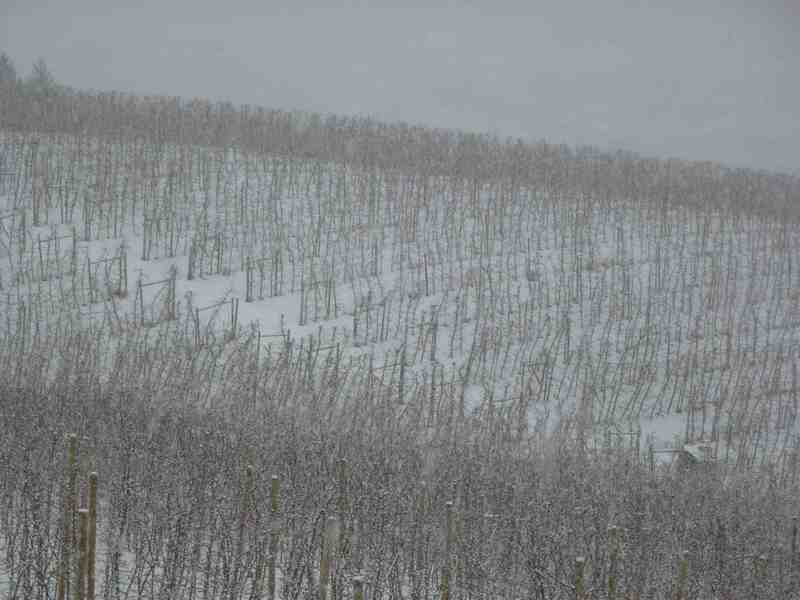 If, however, we could return to orchard technologies that used the entire vertical and horizontal space of the orchard, perhaps we could actually achieve some part of a further 30% reduction on the 61,000,000 cubic metres of water that go annually towards apple production in the Okanagan. That would be 19,000,000 cubic metres, by the way, or about 5 centimetres of water over the entire 351 square kilometres of Okanagan Lake.